Streams of the River: Where is the lamb? Here is an analysis of today's first reading at Mass. It is by the Roman Catholic Biblical scholar Dr Michael Barber. (Go HERE to his valuable website). Dr Barber reminds us that as Christians, following the example of the early Fathers (and the New Testament itself), we read the Old Testament as pointing towards Christ. The ancient Rabbis called this story the Aqedah – the “binding” of Isaac. They explained that this story is just as much about Isaac’s self-offering as it is about Abraham’s faithfulness. They pointed out that Isaac was strong enough to carry the wood up the mountain (Gen. 22:6). They concluded that he was a grown youth, easily capable of overcoming his decrepit father. 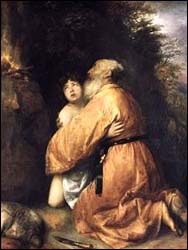 Therefore, Jewish tradition explained that Isaac asked to be “bound” so that he would not be able to struggle against his father and crawl off the altar.